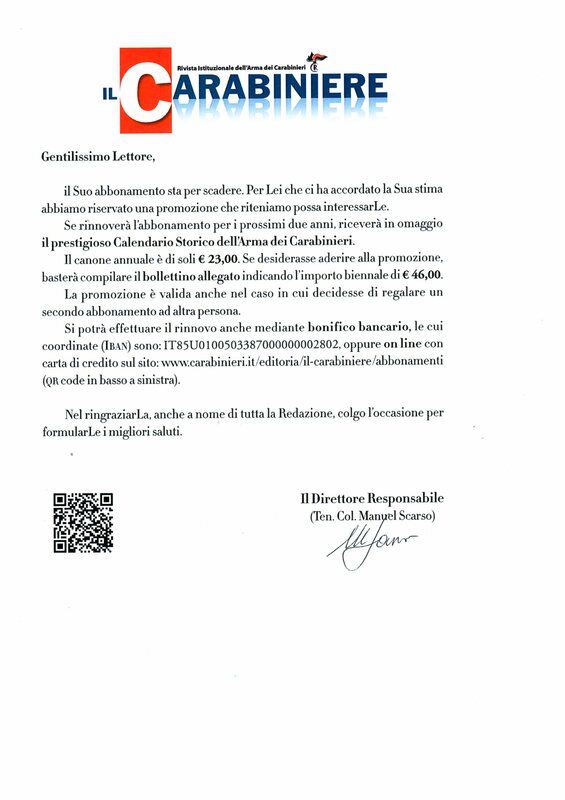 ATTENZIONE: QUESTO SIGNORE CHE RICHIEDE ABBONAMENTI PRIVATI E PROBABILMENTE CON LETTERE ANALOGHE SPONSOR PUBBLICITARI PER RIVISTE E FONDAZIONI PRIVATE, UNITAMENTE A TUTTI I SUOI PREDECESSORI, SAREBBERO INCOMPATIBILI CON IL RUOLO RIVESTITO NELL'ARMA DEI CARABINIERI, PER ESPLICITA CONVENZIONE FIRMATA CON L'AUTORITA' NAZIONALE ANTICORRUZIONE. SE SI E' IN SERVIZIO ISTITUZIONALE NELL'ARMA INFATTI, NON SI POSSONO PROCACCIARE AFFARI PRIVATI CON ENTI ED AZIENDE. CHIUNQUE VENISSE CONTATTATO PUO' INFORMARE L'ANAC E LA PROCURA DELLA REPUBBLICA COMPETENTE.